The Scheveningen Variation of the Sicilian Defense. Black's central pawn structure provides a solid defense, controls the important d5 square, and gives flexibility to break in the center using e5 or d5, providing richness in flexibility and variations. The Delayed Keres Attack, with the intention of driving the Black Knight from the center. The Perenyi Gambit. White sacrifice the f5 Knight in exchange for an attack. If 10.....Nfd7, then 11. Bc4 and 12. Qh5 with a strong attack. The table has turned. 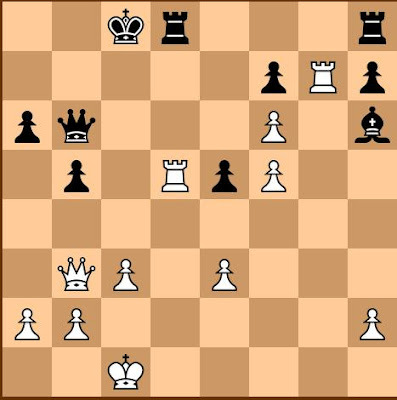 Now, it is Anand who sacrifices his Knight in order to break in the center. Of course, not 12....dxc3 or dxe3 because of 13. Bxf7 Kxf7 and Black loses his Queen. If 21....Bxg7, then 22. fxg7, Rg8, 23. Ne7+ which is favorable for White. If 23......Rxd5, 24. Qxd5 Rd8, 25. Qc6+ and White gets a strong attack. White defends the e-pawn against Qxe3 which would be disastrous. White resigns. He cannot avoid mate without losing his e5 Rook.